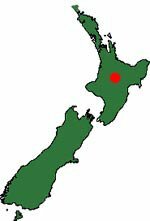 Categories: Central North Island Destinations N.I. Lake Taupo trout fishing for wild rainbow trout centred on Lake Taupo, and its tributaries, is justly famous the world over for being one of the most productive anywhere. Many visiting overseas anglers travel to New Zealand to test their skill in this premium trout water. There are also brown trout in the Lake Taupo fishery but they are much harder to catch! The ratio of trout in Lake Taupo is 90 percent rainbows to 10 percent browns. The rainbows tend to feed in open water on smelt whereas the browns feed much closer to shore on bullies, koura (freshwater crayfish), frogs, mice and insects. Brown trout were first introduced to Lake Taupo in 1887 and rainbow trout a little later in 1898. For the first two decades, the newly introduced trout grew in both size and number at an incredible rate. Unfortunately by 1912 the koaro, a small native whitebait fish preyed upon by the trout, could no longer sustain the fishery. The size and numbers of trout in Lake Taupo went into steep decline. The following year netting was undertaken to reduce trout numbers. Lake Taupo float plane. Click on the picture to enlarge. Size and condition of trout in Lake Taupo continued to fluctuate. Perhaps the best fishing of all was during the early 1920s when there were large numbers of well conditioned 20 plus pounds fish being caught. In 1934 native Smelt – Retropina retropina – were introduced into Lake Taupo as trout prey. The smelt took to Lake Taupo well and developed into a large self-sustaining population. By the early 1960s trout size and condition had improved markedly over previous decades. Although there have been more ups and downs; the Lake Taupo native trout fishing today is in excellent shape! Lake Taupo trout fishing is quite different to other other parts of New Zealand in a number of ways. Lake Taupo offers a quite different fishing experience to the rest of New Zealand and in particular the South Island. Spin fishing is very popular around South Island lakes and rivers but is rarely practiced around Lake Taupo. Lake Taupo Fishing District Map. Map reproduced from The Taupo Fishery Regulations 2004 – Taupo Fishery Area – Tongariro/Taupo Conservancy by permission of the Department of Conservation. Crown Copyright Reserved. Important Notice. This Taupo Fishing District map has been reproduced here solely to provide an indication of the Taupo Fishery. Some of the information on this map may be subject to change over time. 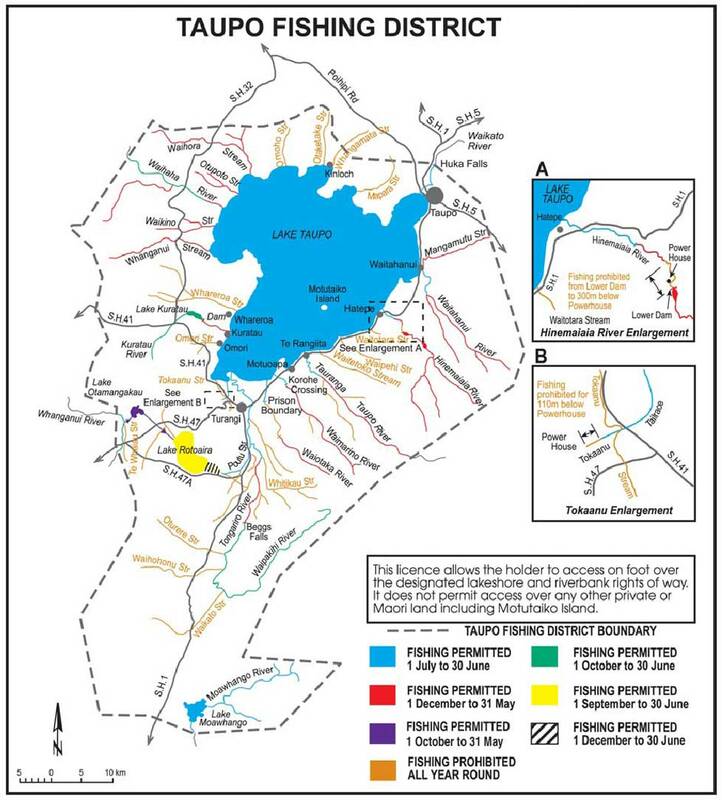 For up to date information about the Taupo Fishery including: the separate fishing licence required to fish it, regulations, maps and access, anglers are advised to visit the Department of Conservation Taupo Trout Fishery website. Click on the map to enlarge in new window. At least several dozen large charter launches operate on Lake Taupo taking groups out on both sightseeing and fishing trips. There is plenty of excellent accommodation in the township and at other places around the shore. Most importantly there is good accommodation to suit any angler’s budget. Lake Taupo trout fishing is permitted all year round. 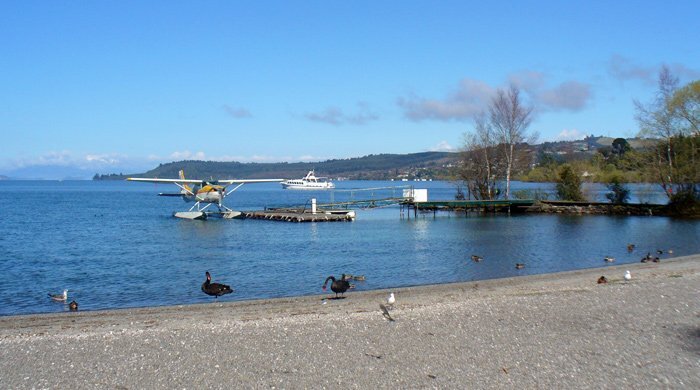 There is no closed fishing season on Lake Taupo. Unlike the rest of New Zealand, a separate fishing licence is required to fish the Lake Taupo district. The fishery is administered by the Department of Conservation. You cannot use your Fish and Game licence in the Taupo region. The Lake Taupo trout fishing season begins on the 1 July each year and ends on 30 June. For the 2011-2012 season, licence charges were: Adult Whole Season NZ$90.00, Adult Week NZ$38.00, Adult 24 Hour NZ$17.00, Child season NZ$12.50, Child 24 hour NZ$4.50. You must purchase a fishing licence before you go fishing! The daily bag limit for Lake Taupo is 3 trout. If you have caught and kept 3 trout you must stop fishing immediately. If you wish to continue fishing and practice catch and release you must not kill more than 2 fish. The minimum size limit is 40cm from the tip of the nose to the fork of the tail. For details on where to obtain a Taupo Region fishing licence and a copy of the fishing regulations contact the: Department of Conservation Turangi Office. The majority of trout caught on Lake Taupo are taken by trolling lures and flies from boats. The most popular trolling lures are Tasmanian Devils in the following colours: Clown – white with red and black spots, Orange with black stripes, and the red, orange and green Traffic Light. Johnson’s Kobras: Yellow and white, Green and white, Traffic light, Gold with the red stripe and black spots. Old brass Tobys coloured black with gold stripes, or green with red spots are also deadly trout takers on Lake a Taupo. The flies used for trolling and harling are, perhaps confusingly, also called lures. The most popular feathered lures, in size 4 down to 8, are Parsons Glory, Red Setter, Kilwell No.1, Green Orbit, and Woolly Buggar, though many other patterns are fished successfully. Lake Taupo Fishing Guides Chris Brennan Professional Fly Fishing Guide Fly Fishing Trips Lake Taupo Fish and catch trout with Taupo’s most experienced charter boat operator, Richard Staines. He has 30 years of charter experience on Lake Taupo. Trout Fishing aboard White Striker. The Tongariro River delta covers a vast area best accessed by boat. This offers superb wet fly fishing in winter and equally good dry fly and fishing with weighted nymphs during the summer months. There are large numbers of brown trout in the delta and lower river where shore access is also very good. Fishing is allowed upstream from an anchored boat as far as the white poles with yellow and black stripes. The Tongariro River is fly fishing only. Spin fishing is not permitted. Of the six rivers that flow into the eastern side of Lake Taupo, the Tongariro River is by far the most famous offering some of the best trout fly fishing to be found anywhere in the world. Lake Taupo trout fishing opportunities are enormous when you consider not just Lake Taupo itself but also the surrounding rivers and streams in the district. Many of these rivers are fantastic international trout fishing destinations in their own right. The Tongariro River between the State Highway bridge and the Red Hut pool is extremely popular and provides excellent access from both banks. There is excellent water for the dry fly exponent between the famous pools that make up this section of the river. The Major Jones Pool, Judges Pool, Hydro Pool, Admirals Pool and the Breakfast Pool represent the holy grail for fly anglers the world over. This stretch of the Tongariro River is very popular. There are often large numbers of anglers fishing in close proximity. It is important to observe local angling etiquette in order to avoid arguments. The best fishing method for these middle sections depends on a large degree on the time of year. Dry fly and nymph fishing are popular in summer and autumn, and there is good wet fly fishing all year and particularly in winter. This section of the river above Red Hut footbridge is more challenging requiring the angler to wade between boulders and through rapids. The rapid flow makes for exciting fishing as well as hard work wading. The pools are small in this upper section, and the bottom bouldery making wet fly fishing difficult. This upper section is best suited to nymph fishing in winter and dry fly fishing in summer. The Tauranga-Taupo River is the second largest in the Taupo fishery. It is a small to medium sized river. The good thing is that the riverbed is mostly gravel and small rocks making for ease of access on foot and most importantly easier casting. Public access to this river is however limited upstream though access is good to the mouth and lower river from State Highway One at Te Rangiita. Wet fly fishing is more difficult on this smaller water. Nymph fishing is the most popular fishing method. The best time to fish the Tauranga-Taupo River is following rain when it is discoloured. Fishing it when the flow is low over summer can be a real challenge. Fly anglers everywhere will have read about the famous Waitahanui ‘picket fence.’ This small spring creek is the closest river to Taupo township. The mouth and lower river are readily accessible from State Highway One in Waitahanui. The ‘picket fence’ is best fished with a weight-forward medium sinking fly line and a Parsons’ Glory during the day and a darker pattern after the sun goes down. It is not a good place for the beginner as the experienced anglers will be fishing quite close together and making long casts! If you lack the confidence for this sort of fishing you might be better to move along the beach a bit out of the way. Separate Lake Taupo Fishing Licence Required A separate Lake Taupo trout fishing licence is required to fish for sports fish (trout) in the Lake Taupo district. The Lake Taupo district is administered by The Department of Conservation, whereas the remainder of New Zealand’s sports fishery is administered by Fish & Game New Zealand. Lake Taupo Fishing Reports See TaupoFishing.co.nz for up to date information about Lake Taupo, its Tributaries and the Central Plateau, Dragonfly River Guides, and shop. Fishingmag Newsletter If you found this article useful please subscribe to the Fishingmag Trout & Salmon Email Newsletter. Get free fishing ebooks, updates, and our latest article releases. Take a Chance Fly Fishing Lake Taupo district.